Gentlemen, do you know that wearing the wrong type of belt for men can ruin your outfit? Even if you find yourself finely dressed, however, displaying an unsuitable sort of belt as an accessory defeats its purpose. First of all, a belt by definition is a cinching system surrounding your waist that assists you in holding up your pants. You’ll be surprised to learn that there are various kinds of belts such as dress, casual, and likewise belts for organizing your belongings. In like manner, a belt can also be your accent piece to augment your choice of outfit or it can likewise be a statement piece that calls for attention. Nevertheless, whatever your reason for needing a belt it is essential that you decide on the right one to reinforce your outfit. How do you pick the right size belt? Which way should a man wear a belt? How do you determine men’s belt size? Do men’s shoes and belts have to match? How do you buy a men’s belt? What color of a belt to wear with jeans? Generally speaking, whether you’ll be wearing a dress or casual pants, it typically has a loop designed for belts. For this reason, we are providing you with the best belts for men you can choose from. In the event that you will be carrying a substantial amount of weight such as your gear, tools, flashlight, or gun, a solid belt is essential to evenly circulate the load on your hips. A strong belt will not only keep your items organized but will also help in holding your pants up as well. Take a look at our choice of top 10 tactical belts for men. Are you an adventure or airsoft enthusiast? Attach your guns or tools on this sturdy Airsoft Utility Military Tactical Belt while you are strategizing with your team or out running and shooting opponents. The Cobra name is famous in the industry for its high-quality buckle system. In fact, its reliable fastener is produced from 7075 aluminum. During urgent situations, you’ll learn that the lock is simply quick to open, yet it won’t unlock if it’s load-bearing. In the meantime, your tactical belt shouldn’t always be thick and massive looking. In purchasing the Thin Parachute-grade Outdoor Tactical Belt, you get a slim yet reliable heavy-duty accessory. Similarly, this Light-weight Emergency Rescue Tactical Belt is perfectly thin. This belt is suitable for police, operators, and military soldiers. It comes in cool two-toned shade plus the product is scratch resistant. A good tactical belt doesn’t only come in black or camouflage kind. It can also come in this brown variant like this Heavy-Duty Raptor Military Tactical Belt. Nonetheless, if you prefer camouflage then, by all means, check this Quick Release Cobra Lock Tactical Belt. It is both waterproof and weather-proof suitable for your outdoor adventures. Strong and rugged, that is the Loop-Lined Operator Tactical Belt. With this belt, you can simply insert and tailor your holster and pouches the way you want it. Need a belt that can hold tools of massive weight? Remarkably, the Load-bearing Tool Military Army Tactical Belt can do just that. It boasts of solid heavy-gear nylon that can fully carry your tools while you work. Though the Light-Weight Wilderness Tactical Belt is made from nylon mesh it is absolutely rugged. This tactical belt while narrow in size is tough and is capable of carrying enormous weight. Can’t decide what color suits you? The Stitched-Reinforced Durable Tactical Duty Belt is available in three variants allowing you to pick the ideal shade for you. 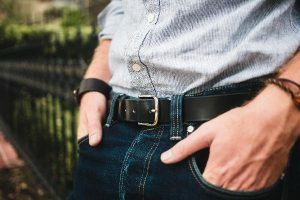 Now, for belts to match your casual and formal outfit here is our roundup of best leather belts for men. Essential to every man is a black belt. It is an accessory that you can pair to your everyday jeans or your stylish trousers. Are you feeling bold and adventurous? 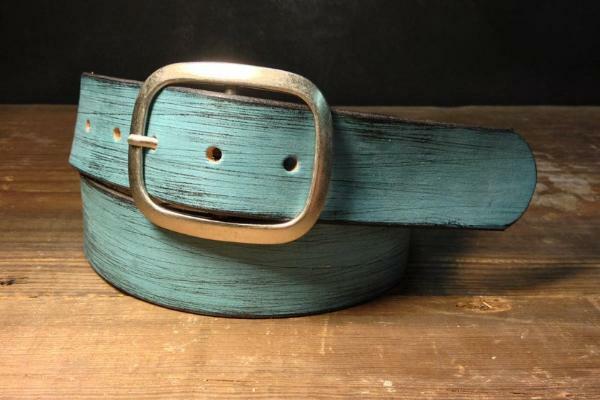 Wear this blue distressed leather belt and show the world your feisty and fashionable side! Surprisingly, this rugged water buffalo distressed belt is lightweight. It offers a sturdy antique brass buckle but will not pull your pants down. Tired of the conventional rugged thick belt? Pair your jeans or khaki pants with this Casual Thin Leather Belt. It is sleek and provides you with a vintage look. For those who are brand conscious and looking for a high-quality accessory, the Vintage Coach Black Leather Belt is for you. Perfect to wear for those formal events, this classic belt comes in a soft and pliable leather material. Otherwise, the Yves St. Laurent Vintage Leather Belt is also a great option for you. This classic accessory is suitable for your trousers and dress pants. 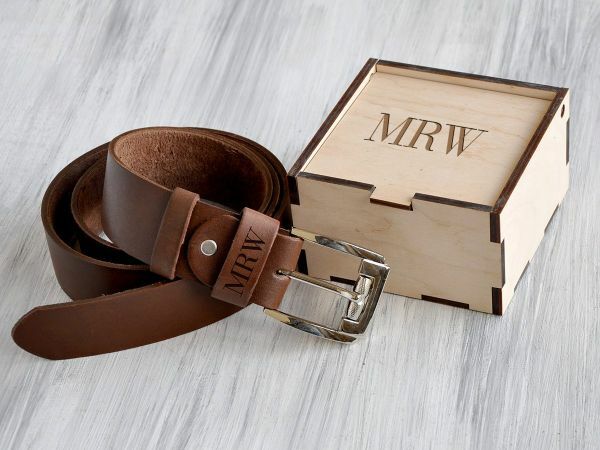 Women searching for an amazing gift to give for those special men in their lives must check this Personalized Leather Men’s Belt. Giving a customized present to your loved one gives the message that you carefully planned out your gift. In this case, the Men’s Heavy Duty Belt is compatible for those seeking a tough and solid accessory. This product has a buckle with snap fasteners allowing you to change it with your own personal buckle. 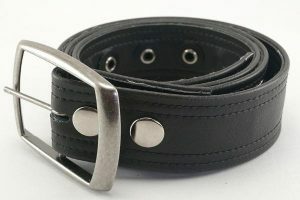 Whether you require a black or brown belt, this is not an issue with the Reversible Black Leather Belt. This stunning belt comes in authentic Italian leather and allows you to reverse to a brown belt. 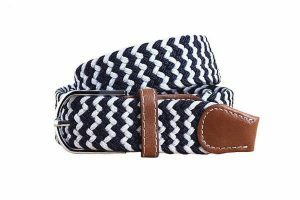 Looking for a unique belt for men you can wear? Try using one that is personally crafted for you like this Men’s Personalized Leather Belt and for sure you’ll stand out from the crowd. Although most men would safely depend on a brown or black belt, this should not always be the case. Remember that men are likewise allowed to be daring with their wardrobe. 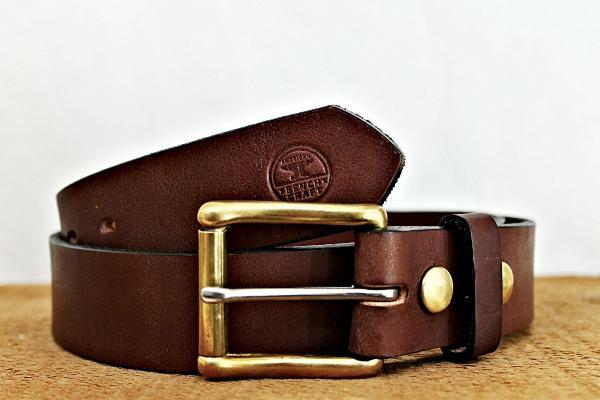 You can up your bold move with this richly colored Natural Leather Belt for Men. In picking the right size for you, keep in mind to select a belt that is two or three sizes bigger than your trousers to get a nice fit. For instance, if your pant size is 34″, then a belt with a 36″ to 38″ fit will be a good tailor for you. Then again, the best way to know is to try on the accessory inside the store. To clarify, there is no right or wrong way to wear a belt. If how you do it is the manner that makes sense to you, then, by all means, go for it! In general, though, you will observe there are men who wear this accessory pointing to the left or to the right. Notably, with the British Army, this group instructs their soldiers to insert their belt on the left side loop of their trousers. Traditionally also the belt buckle gives the direction for the belt. Fortunately, at present time, there are belt buckles that you can wear whichever way without it turning upside down. Again, the direction doesn’t matter. What’s important is that you are comfortable in how you wear and thread your belt. There are several ways to determine your belt size. As mentioned earlier, one way is to add 2″ to your pant’s size. This will suit perfectly for those trousers that hang normally on your waistline. On one hand, if you typically wear low rise jeans or pants you can add 3″ to 4″ to your belt size. You can additionally determine your belt size by measuring your body. The first step is to guide the tape measure through the loops of your pants. See to it that you are standing in a natural and comfortable position. With the tape measure secured to your body, take note of the measurement in inches and round off to the closest inch. Always remember that your belt must always match your shoes. A leather belt should match leather shoes. The rule is the same whether you are dressing up or down. If you have a glossy belt on. you can partner it with strikingly polished footwear or dress shoes. At the same time, match matte belts with the same shoe finish. In case you are wearing cloth shoes, you can pair it with a variety of cloth belts. Alternately, loafers which is a type of shoe also come in various material and texture. Indeed, there are lots of belt for men that are similar looking. However, note that the belts may look the same but the cost hugely differs. One of the reason for this is the leather quality. A belt with fine quality will have smooth and pliable leather. Before purchasing your item, test the flexibility of the accessory to ensure it is not frail or brittle. You can likewise check this by gently pressing your fingernail at the back of the belt. When a thin line appears, it means the material is still supple and new. If what you have in your hand is old leather, it will be able to repel your nail. Besides the flexibility of the belt, another element to consider is construction. Make sure to search for belts with rigid and small stitching that allows for no loose ends. In buying your belt, know also what type of buckle you prefer. There are presently belts that permits you to change buckles while there are also ones that are sewn in place. While there are some who feel the brand is also a factor to look into, however, it is best that you spend your hard earned money on the quality of the product rather than the name. Meanwhile, a dark brown belt is the common choice for denim washed jeans. For those who prefer khakis, your belt color must rely on the type of shade of your pants. Since khaki is in the brown assortment, you can keep it easy with a simple brown belt. On the other hand, wear a black belt for very dark khaki pants. If you prefer to be daring with your outfit, you can likewise opt for woven multicolored belts which will go well with your casual khaki pants. Furthermore, you will find belts with colorful graphics and designs intricately stitched on cotton belts that usually comes with leather tabs. To help you minimize your accessory, you can choose reversible belts that offer two different shades or numerous fabrics. For example, there are now available belts in the market wherein a brown leather reverses to a black leather belt. 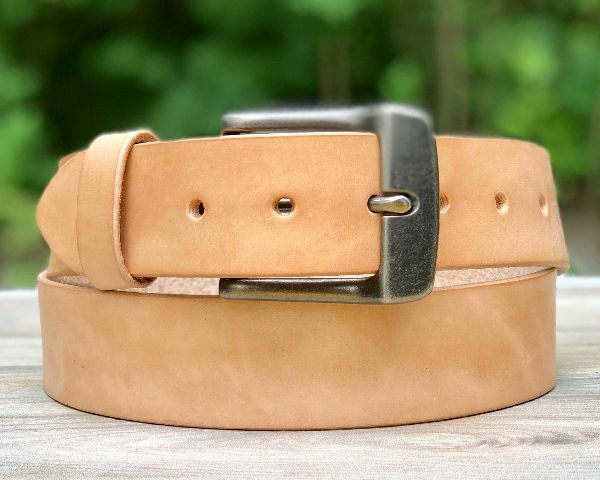 Moreover, there is a brown leather accessory that reverses to a cotton canvas belt. Owning one or two of these items will surely simplify your clothing and declutter your cabinet. Given these points, selecting the right belt for men is now a painless task. Again, aside from the belt’s flexibility and construction, keep in mind to prioritize the quality of the product you are eyeing instead of the brand name. Likewise, take into consideration the color and the material of your pants and shoes before choosing the right belt. In following these tips, we can assure you that you will never go wrong with your choice.